GILBERT S. GORDAN, M.D., Ph.D.; FLOYD M. ESTESS, M.D. ; JOHN E. ADAMS, M.D. ; et al KARL M. BOWMAN, M.D. ; ALEXANDER SIMON, M.D. Since Kety and associates1 reported that the cerebral blood flow (CBF) and cerebral metabolic rate for oxygen (CMRo2) are normal in schizophrenia, patients with this disorder have commonly been used as "normal subjects" for cerebral metabolic studies. In the course of such studies we have noted unusually low values for CMRo2 in approximately one-third of patients with chronic schizophrenic reactions. 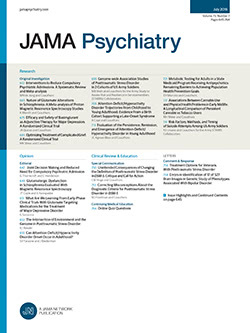 Using the original nitrous oxide technique of Kety and Schmidt,* we have made 29 determinations of CBF and CMRo2 upon 24 patients with chronic schizophrenic reactions of two or more years' duration and have compared these with the rates in 81 control cases.